Cook sausages according to the package directions. I use a large frying pan. 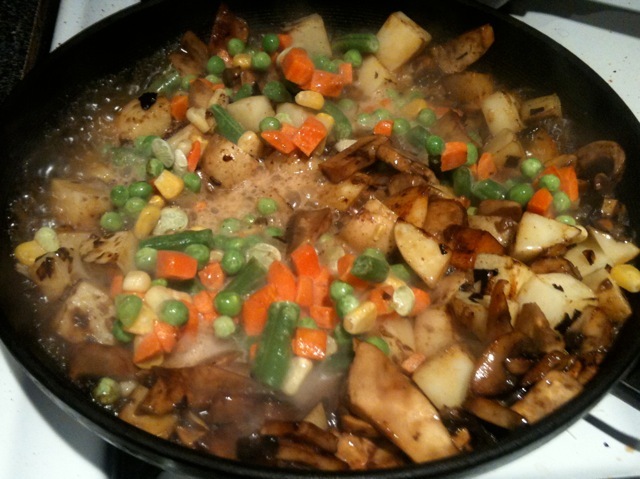 In another pan, heat the vegetable oil. When hot, saute the onions and garlic. Add the potatoes and cook until the potatoes are browned. 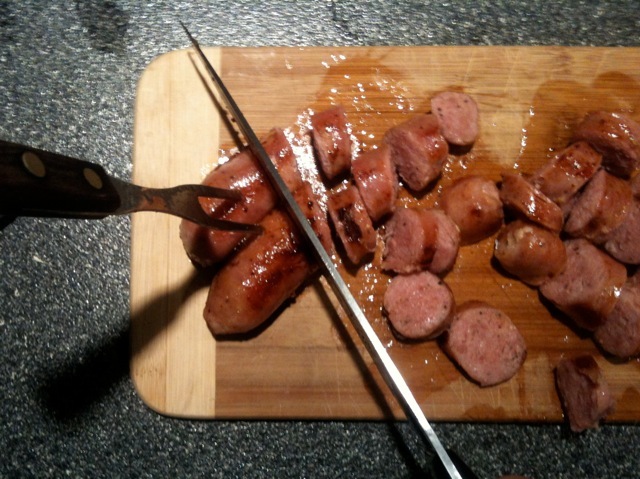 Take the sausages out of the frying pan. Add the mushrooms to the sausage pan and cook while the slicing the sausage. 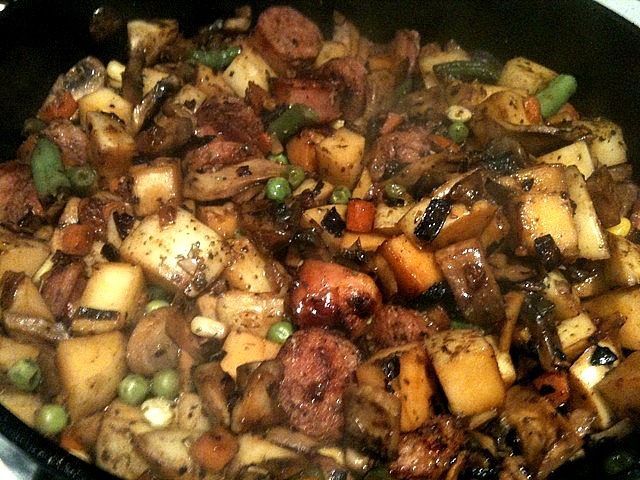 Add the mushrooms, the frozen vegetables, half the beer and the herbs to the potato mixture. Saute the sausage slices in the empty pan. 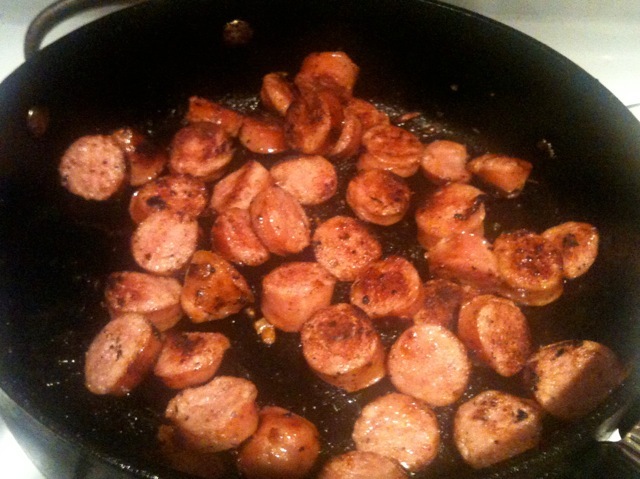 Once the sausage slices are browned, add those to the pan with the rest of the ingredients. Deglaze the empty pan with the other half of the beer. Add to the vegetables and sausage. Stir thoroughly. This dish is still kid-friendly as all the alcohol evaporates as it cooks. Frugal Tip: Just say NO! Recently, the number of things you can get extended warranties has increased hugely (and, in my opinion, comically). I was in a major chain store, buying a DVD for under $10.00 and was offered an extended warranty on it for “ONLY” $4.00. When I asked the clerk what the extended warranty would give me (even though I never intended to purchase it), she basically told me that if there was anything wrong with the DVD, I could return it and get a new one. Well, if there is anything wrong with a DVD when you open it, you can already get a new one without the extended warranty . This warranty did not include damage that occurred to the DVD after we opened it nor other things. GADS! So, this store was offering to sell me (for 40% of the cost of the item) the protection I already had. Hmmm. Just say no! That is not to say that all extended warranties are bad or inappropriate. I do have them on some of my select purchases, but I investigate and carefully figure out what the chances of my needing the warranty are and what the cost of would be to take care of the problem with the warranty and without it. In the overwhelming proportion of cases, for me, the extended warranty is NOT worth it. I think I have all of two things in my possession that have an extended warranty and that is because they are portable and liable to damage AND the extended warranty covers some of such damage. I read a report somewhere, that most of the money that is made on many products today comes from the sale of the extended warranty , not the product itself. Now THAT, tells me something! the directions don’t show up when i click on the print link.